Price: Free with voluntary donations to Action for Happiness & Anxiety UK. 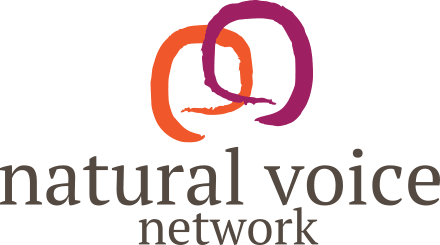 My name is Mary Bourne and I’ve been an NVN member for 10 years. To celebrate this milestone, I am sharing the score for my original composition “Do You Hear My Voice”. As NVN practitioners we are all aware of the huge benefits of group singing. Choir leading in my community has created so much happiness for so many people over the past 10 years whilst also helping me to find my own strategies during more difficult times in the past. My composition “Do You Hear My Voice” is part of an awareness campaign for two charities very close to my heart. By downloading my free score, you will be supporting the work of AnxietyUK and Action for Happiness who will benefit from any voluntary donations given for the score. There are over 40,000 choirs in the UK alone. I’m looking to reach as many as I can and to raise £8,000 if possible. Ultimately the decision is yours to donate or to simply enjoy singing my composition. It’s been described as an uplifting anthem, and with two arrangements available you can enjoy teaching a simple unison or SSA (+men) version. There is a piano accompaniment, but the song works just as well when sung a cappella – the addition of a drum is recommended. 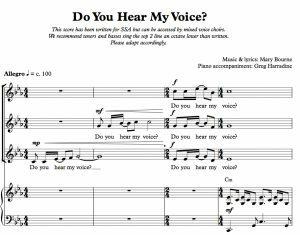 You can read more about the “Do You Hear My Voice” campaign and download the score from my website.